My two youngest kids are 19 months apart. When Little Missy was born, I already had all the baby gear I needed from my toddler son, with one exception. I got rid of Ben's bouncer seat when he outgrew it. It was a popular Babie's R Us brand, which was flawed to no end. I hated the way my son's neck always looked pushed forward in this bouncer because the darn thing was made too round. The seat was also too deep which I felt put pressure on baby's back. Ben never looked very comfortable in his bouncer and I never let him sit in it for more than a few minutes at a time. The seat fabric was velvety polyester. It made my baby sweat and was incredibly staticy, attracting every piece of dirt in the house. As soon as Ben was able to sit on his own, I got rid of that piece of junk, intending to find a better seating solution if I had more kids. Fast forward to the arrival of Little Missy. For the first 4 weeks of life, the little darling decided that sleeping in a crib, bassinet or stroller just wasn't her "thing". She only slept in someone's arms and woke up as soon as we tried putting her down. When she wasn't sleeping, she was crying. I was getting quite desperate to find a place for Little Missy where she'd relax at least long enough for me to use the bathroom. It was clear that no bouncer seat would do. I considered swings and researched various options, but nothing looked quite right. 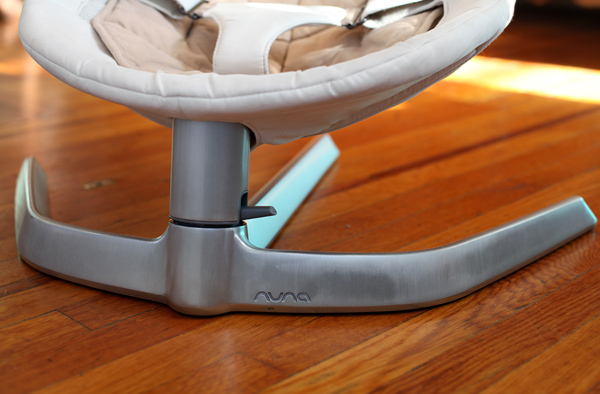 I've also seen the Nuna Leaf baby lounger online and was intrigued by it's design, but considered it too extravagant for our means. Well, there came a day when my desperation to have some freedom from holding Little Missy 24/7 reached it's limits. As soon as my parents came for a visit, I literally ran out the door, went to the nearest baby store and came back with the Nuna Leaf. Somehow I hoped that Little Missy would appreciate the gentle swaying motion. I was not disappointed. Now that my daughter is 5 months, I have to say that the Leaf was the best purchase I ever made. Ok, that sounded overly dramatic. It is the best purchase I made so far for baby #4. 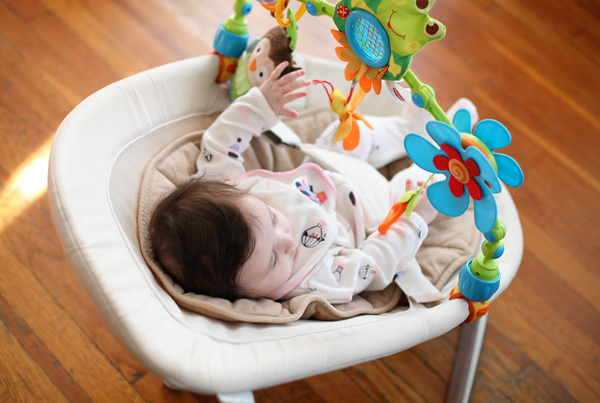 The Leaf is unlike any other baby lounger on the market. It is innovative and simple. Of course, the first thing that attracts one's attention is the design. The Leaf is hot! 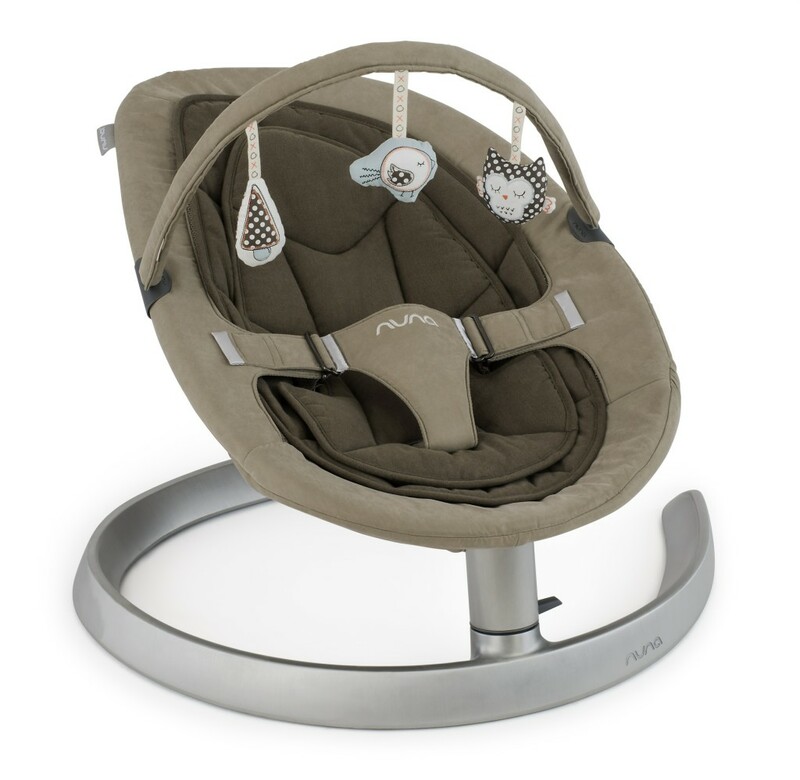 It has this pure, clean, contemporary look and does not appear to be an eye sore like so many other baby seats. There are three different versions available: the original Leaf, Leaf Curve and Leaf Luxx. I chose the original because it's the lightest and the least expensive of the three. 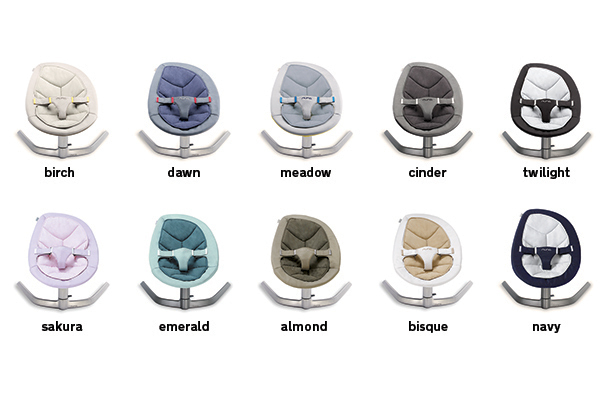 The original Leaf is available in 5 colors in USA and in 10 colors in Europe. The color I chose is Bisque, which is ecru with a tan liner. In case you'd like to update the color of your Leaf, replacement seats can be purchased separately for $90. Quite pricey for just a little bit of fabric, but considering the long life span of the Leaf, I guess you get what you pay for. The base of the Leaf is made out of aluminum alloy. It is very sturdy and sleek looking. Also, what I find really incredible is that this lounger can support a weight of up to 60kg or 132lb! 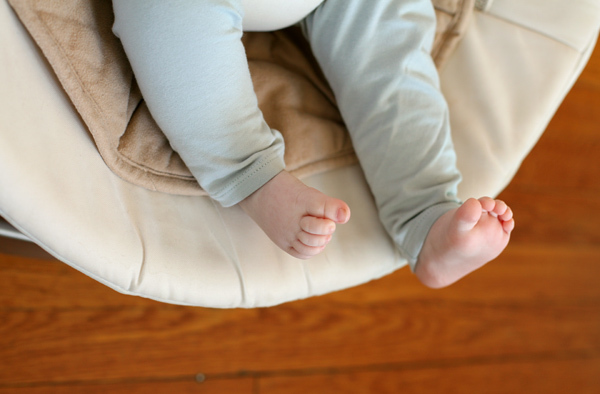 The Leaf grows with your child and remains a comfortable place to relax long after the baby stage. Heck, I could probably sit in it! The seat portion is made up of two layers. Both are easily removable and machine washable. The bottom layer is a soft border with double layer of very strong mesh. The velcro buckle is attached to this layer. 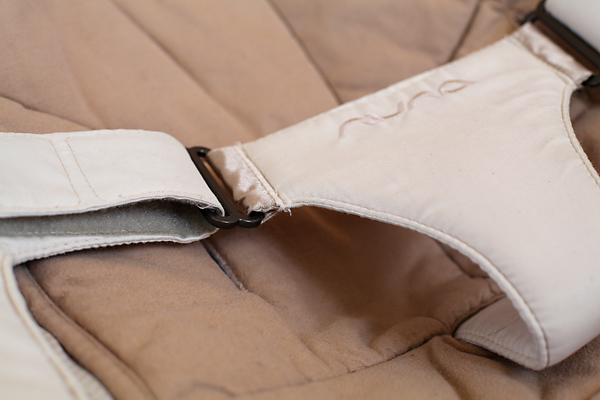 Top layer is a removable plush liner which is made of Oeko-Tex certified organic cotton. 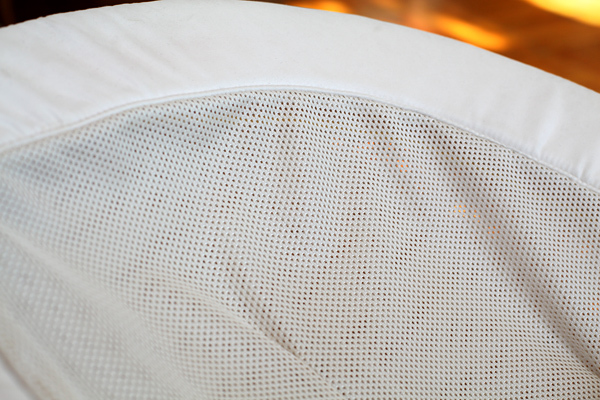 On a hot day, you can take off the soft pad and your baby can sit directly on the mesh seat for better air circulation. Though as I mentioned the seat is machine washable, do be careful with the drying. I accidentally shrunk my Leaf liner. As you can see in the pictures, it doesn't quite cover the whole seat anymore. For some reason, a lot of bouncers and swings manufacturers just can't get this one right. The first thing I noticed upon placing my infant in the Leaf, was how perfect the incline was. It's not too deep or too shallow, and no matter how tiny your baby is, their head and neck will always be perfectly supported in the Leaf. The seat has just the right shape and gently cradles your baby. What I absolutely love about the Leaf is the totally silent movement. The ball-bearing assembly creates a smooth side to side motion without any sound whatsoever. All you need to do is give the Leaf a little push and it sways gently for over 2 minutes. No batteries, no electric cords, no buzz. Simple and low tech. In case you want to keep the Leaf stationary, there's a little lever on the base which can be lowered to lock the Leaf from swaying. Recently Nuna came out with a battery operated accessory for the Leaf, called the Wind. This little gadget attaches to the base of your Leaf to keep it swaying for as long as you need. There's a built in night light and 6 rocking speeds to choose from. The Nuna Leaf Wind is not in stores yet. Hopefully it will be released sometime this year. Assembling the Leaf is as simple as popping the seat into the base. Of course it's just as easy to pop it out for storage. Oh how I love simplicity! The harness is the one thing I would change about the Leaf. 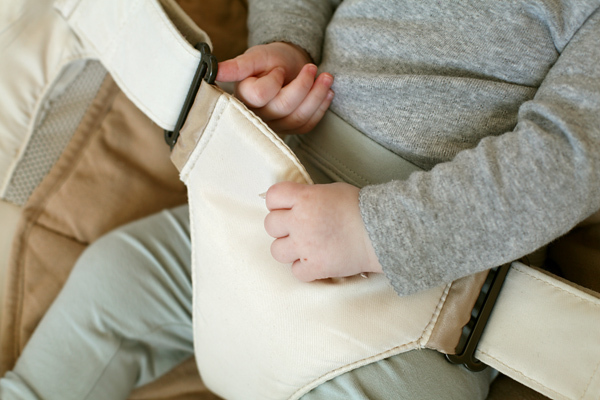 It fastens with a strong velcro and definitely keeps the baby safely in the seat. However, the velco makes a lot of noise and will startle a sleeping baby. When Little Missy was smaller, I was usually able to slip her in and out of the seat without opening the velco, so it's not as bad as all that. Another thing I don't like about the buckle is that it's not removable. 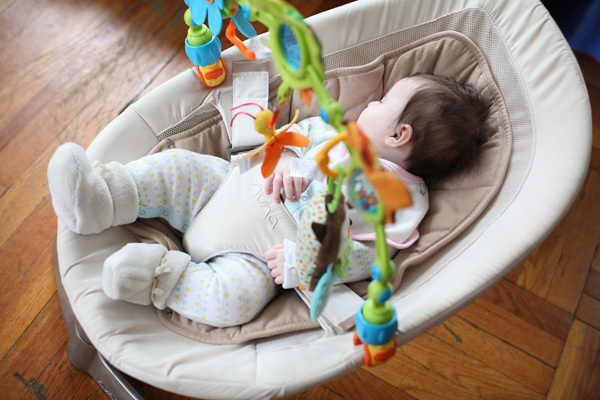 When a toddler or an older child sits in the Leaf, they end up sitting on top of the harness. This doesn't seem to be very well thought through, since Nuna markets the Leaf as "growing with your child". I suppose you can always throw a blanket over the harness to make the seat more comfortable. This is really a very minor flaw in an otherwise PERFECT baby lounger. 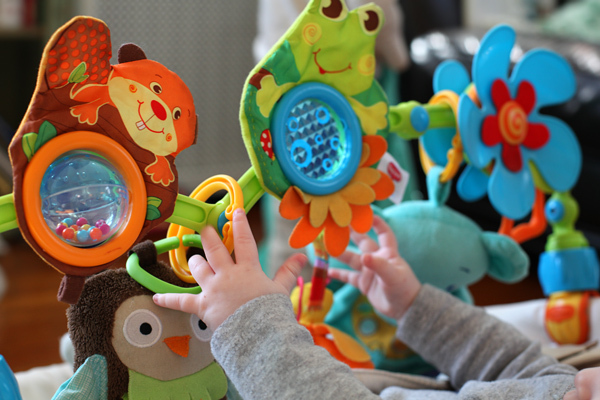 Besides for replacement fabrics, Nuna also offers a matching toy bar for the Leaf, costing $40. Though it's cute, I didn't think it was worth the money, especially since I already had a Tiny Love clip-on arch. Now that I'm on the subject, I might as well review the Tiny Love toy arch . It's another one of those must-haves for baby. This thing can be attached to pretty much anything: strollers, car seats, bouncers, swings, porta-cribs, etc. I bought it for my son when he was an infant and now Little Missy is enjoying it as well. There are three main points of focus on the arch, plus two little hanging toys. 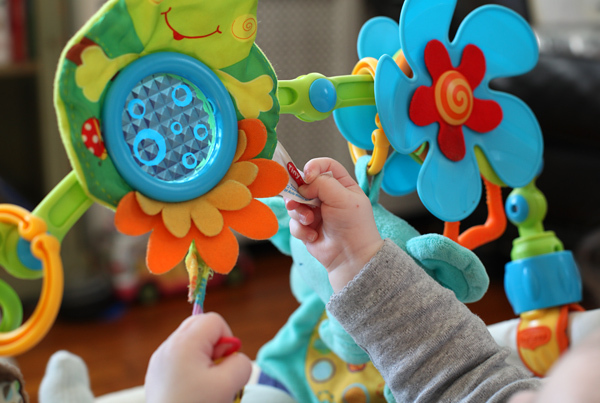 The flower fan rotates when baby tugs on the attached handle. 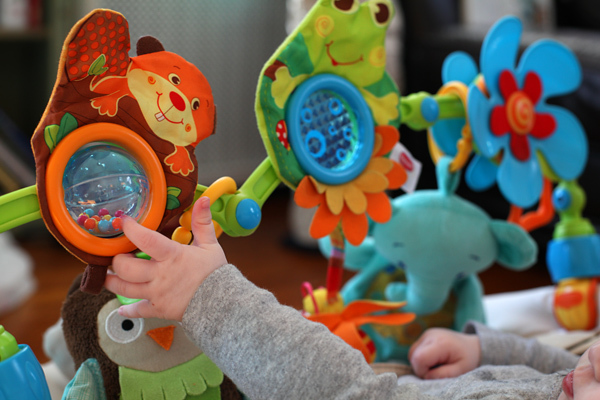 The arch has flexible joints, so you can adjust the angle and height and you can also clip on additional toys. As you can see, the arch is bright, happy looking and definitely catches baby's attention. Before Little Missy learned to reach and grip toys, she enjoyed staring at the animals. Tiny Love toy arch is available in 3 colors and costs $23 on Amazon. That looks like an awesome bouncer. Love the sleek clean design, doesn't look tacky like so many other baby products out there.